Sleep is the foundation of physical health and emotional well-being. With all that modern living brings, we have forgotten the art of relaxation. Insomnia affects 30% of the population in the US, at an overall estimated cost of $30-35 billion per year. Non-restorative sleep impacts an even larger percentage of the population. You might not wake up during the night, but your sleep may not be fully rejuvenating you if you have to drink caffeinated beverages during the day. That’s why we created this 2-CD set with comprehensive information about insomnia, as well as valuable tips and practices to enjoy a fully restorative sleep. This audio offers the best of the modern and traditional knowledge, combined in one package to improve your quality of life. With RxRelax, for the first time ever, you have expert recommendations on medical and natural products, combined with inspirations for lifestyle change and Yoga Therapy practices all in one place. We hope it helps you meet your wellness goals by enjoying the completely rejuvenating experience of sleep. Disc 1 explores the functional significance of sleep and consequences of non-restorative sleep. It discusses medications and adverse effects, and also includes a short power nap that can be used during the day. Disc 2 offers a guided experience of very deep relaxation for your body, mind and emotions to help you slip into sleep. 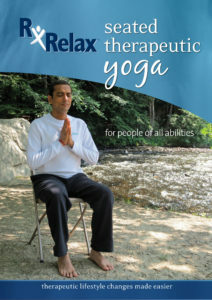 Brought to you by the award-winning team at RxRelax, this DVD provides therapeutic yoga techniques to help you rejuvenate yourself. Jay Gupta, a pharmacist, master yoga teacher and integrative health innovator, expertly guides you through this unique seated practice. You can do the full 60 minute practice, or select options for shorter sessions to work with specific parts of the body. Jay has brought these science-smart practices to audiences across the USA. Now you can enjoy them from the comfort of your home. What he shares is easy-to-do, effective and a lot of fun! What if there was a medication to train your brain to relax? RxRelax makes it as easy as taking a pill. This CD provides three short relaxation capsules that are easy to do, and help shift the body and mind into a profound state of well-being. Foster self-compassion, resilience and mindfulness. Whether you experience stress, fatigue or difficult emotions, you can use any one of the these simple, research-based techniques to restore your nervous system. When you are relaxed and focused, your brain cells are most able to re-wire to healthier patterns of resilient living. In this way, we can significantly manage our own daily experience. Copyright © 2019 · RxRelax...Therapeutic Lifestyle Changes Made Easier! All Rights Reserved.